This Summer the patio has become the ideal hangout location for us. We live in a tiny Dupont apartment and having the patio creates an "extra" room, adding much needed footage to our living space. This is how the patio is looking this Summer. We try to eat at least twice a week outside. We also have a kiddie inflatable pool for afternoon splashes, and Emilu and I also do many activities out here during the day. Up until this last heat wave, we were able to keep the AC off and the door and windows open, giving our apt. a roomier feel. 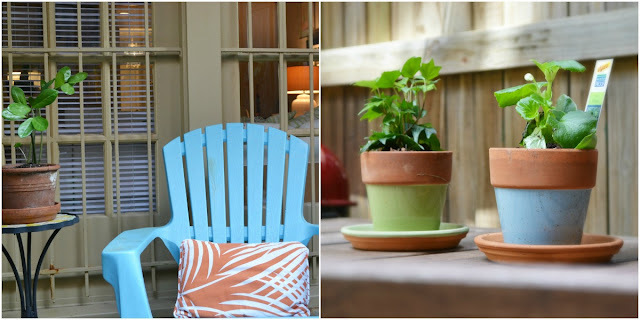 Do you have a patio or better yet, a backyard? I suppose, that's one thing I do miss about living in the suburbs. But I tell myself, everything has its stages, and so eventually we will have a yard (with a house). Aww your patio is so pretty! We live downtown so the only thing we have is a balcony that we totally adore. It's one of those open spaces that add such a great vibe to the flat. We try so chill there in the evenings (a lot). Btw: did you painted those flower pots yourself? (the last photo on the right). They look beautiful. Kisses, darling. Thanks Diana. A balcony is just as good, as long as it's somewhere outside im a happy camper. The pots came like this. I thought about painting all my pots this way, but then I'd end up with a toy store as patio. Maybe next Summer I can revamp them with some clever design, since they are all occupied with plants now. You have an adorable patio, I love it! Its flipping freezing here in Cape Town at the moment and I desperately miss spending time outside... so jealous of you! So sweet thanks. You'll be warm again in no time!